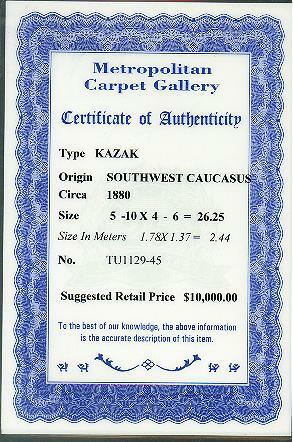 Metropolitan Carpet Gallery's staff is proud to service the antique oriental rugs community for the last 25 years. 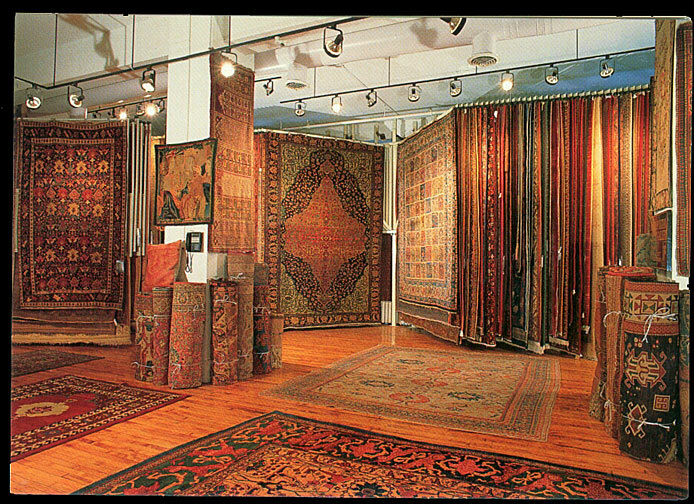 We have a large collection of antique rugs and carpets for all sort of requirements. You are cordially invited to browse our web site, or contact us for further assistance. You can also review our collection at our gallery which is located at 36 East 31 Street, Room 1001, in New York. We will ship any item on an approval base if you can not visit our showroom, and we also accept all major credit cards. Each item is accompanied by a CERTIFICATE OF AUTHENTICITY, which indicates the Type, Origin and the age of the item. We guarantee the accuracy of the certificate including age within 10 years for items of up to 100 years old, and 25 years for all items of 100 to 300 years old. If any inaccuracy is proved after the final sale, you are entitled to a full refund. Sample copy of the certificate is presented here.